I was driving the rather reluctant Moose to his surfing lesson this morning through the wind and rain when I suddenly remembered that the loose objects rolling around in the back of the car were two cartons of milk. In my day young men learned to surf by stalking older surfers and watching grainy surf videos. You can buy anything these days. However. Milk. Contrary to the opinion of my brother, milk doesn’t go off when left out of the fridge for more than ninety seconds. I remember travelling through Eastern Europe when there was still a Czechoslovakia and being amazed that the dairy goods in the supermarket (and it really wasn’t that super) were stacked in an irregular pyramid on the concrete floor. The milk in the back of my car had been given to me last night after a complicated series of events that I won’t bore you with, except that there was a lot of singing involved and not nearly enough wine, as we were all driving home. It was a cool night last night and the milk had been bought that day, so I was confident that it was still OK.
Not confident enough to let the kids put it on their cereal, I’d never hear the end of it if they contaminated their precious palates with off milk. Did you know that in France they let it go off, even in encourage it by leaving it on the heater, then call it fromage blanc and eat it with a long spoon and a honey biscuit? Travel certainly broadens the mind. What I needed today was a recipe that involved a lot of milk and that resulted in a product that would be soothing to a set of tonsils that had had a very rough weekend. I was going to go with creamed rice, of which I am very fond, but didn’t have an hour to stand around stirring the stuff, what with transporting the Moose and having an appointment with some coppery highlights delivered by my very talented hairdresser who today had to wade through dogs AND children. 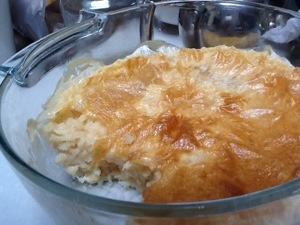 The labour saving and slighter lighter version of creamed rice is the baked rice pudding, and this recipe comes from the 1970 Women’s Weekly cookbook. Rub a stick of butter around a small casserole dish. Dump in half a cup of short or medium grain rice, a teaspoon of vanilla essence, three cups of milk and a quarter of a cup of either brown or white sugar. The version with brown sugar, which I went with, looks less appealing because it’s a bit brown, but I prefer the flavour. Stick it in the oven at 140 degrees for bit over an hour or until the skin on top is a caramel colour. Eat hot or cold or in between. It’s solid enough to slice, and not very sweet so it would be good with a fruit compote if you’re being fancy, or tinned apricots if you’re being retro. I’m eating it on its own, it’s very soothing to a throat that’s got to produce a whole lot of Christmas Carols tonight and a Gaudeamus Igitur tomorrow night.